Herbert Charles Purchase was born at Brimsmore Tree, Yeovil, in 1884. He was the eldest of the six children of cowman and farm labourer Matthew Henry Purchase (1857-1916) and Fanny Matilda née Blackmore (1862-1908). The children were Herbert, Matthew (1884-1960), Sidney Thomas (1887-1965), Frederick William (b1898), Henry Stanley (1899-1955) and Gladys Ivy (1903-1972). In the 1891 census Matthew, Fanny and their three eldest children were living in Larkhill Lane (today's Larkhill Road). By the time of the 1901 census the family had moved to Stratton on the Fosse where 17-year old Herbert worked as an agricultural labourer. Fanny died in 1908 and Matthew moved back to Yeovil where, in the 1911 census, he was living at 13 Great Western Terrace with Frederick, Henry and Gladys. In the meantime, Herbert had married Ellen Louisa Stone (1885-1955) at Salisbury, Wiltshire, in the autumn of 1910. They set up home at Homeleigh, 29 Percy Road, and at the time of the 1911 census Herbert's younger brother Matthew was living with them. Herbert, now aged 28, was working as a leather staker for Pittard & Hamblen. In April 1917 Herbert enlisted at Yeovil, joining the Oxford & Bucks Regiment. However he was transferred to the 2nd/4th Battalion, Hampshire Regiment in August 1917. His Service Number was 40553. On transferring to the Hampshire's, Herbert was deployed to Egypt where his battalion had been since April 1917, having deployed from India. On 15 May 1917 the battalion was attached to 233rd Brigade in 75th Division. Herbert saw considerable fighting, taking part in the Third Battle of Gaza (27 October to 7 November 1917) when his battalion held the front line for a fortnight during which time they repulsed three Turkish attacks (several battles fought for the Gaza to Beersheba line between 31 October and 7 November, were all assigned the title Third Battle of Gaza, although they took place many miles apart and were fought by different corps). The Third Battle of Gaza was fought between British and Ottoman forces during the Sinai and Palestine Campaign and came after the Egyptian Expeditionary Force victory at the Battle of Beersheba had ended the Stalemate in Southern Palestine. The fighting occurred at the beginning of the Southern Palestine Offensive, and together with attacks on Hareira and Sheria on 6–7 November and the continuing Battle of Tel el Khuweilfe which had been launched by General Edmund Allenby on 1 November, it eventually broke the Gaza to Beersheba line defended by the Yildirim Army Group. Despite having held this line since March 1917, the Ottoman Army was forced to evacuate Gaza and Tel el Khuweilfe during the night of 6/7 November. Only Sheria held out for most of the 7 November before it too was captured. The battalion was next engaged in the The Battle of Nabi Samwil, (17–24 November 1917), which was fought during the decisive British Empire victory at the Battle of Jerusalem between the forces of the Egyptian Expeditionary Force and the Ottoman Empire's Yildirim Army Group during the Sinai and Palestine Campaign, The battle of Nabi Samwil, was the first attempt by the forces of the British Empire to capture Jerusalem. The village of Nabi Samwil was part of the Ottoman defences in front of Jerusalem and its capture was considered vital to the eventual capture of the city. The British attacking force consisted of three divisions, two infantry and one mounted. The village was captured by the 234th Brigade, part of the 75th Division, on 21 November 1917. However they still had to defend it against almost Ottoman counter-attacks almost every day. Unsupported by their heavy weapons the British infantry could not break through the main Ottoman defensive line and the attack failed to reach its objective Jerusalem. Herbert's battalion was involved in the Battle of Tell 'Asur which took place between 8 and 12 March 1918. This was after the eventual decisive victory at the Battle of Jerusalem and the Capture of Jericho during the Sinai and Palestine Campaign of World War I. Fighting took place over an area which extended from the Mediterranean to Abu Tellul and Mussalabeh on the edge of the Jordan Valley. The 2nd/4th Battalion, Hampshire Regiment, also took part in the Battle of Berukin during April 1918 but there is little or no information available. On 2 May 1918 the 2/4th Battalion moved to France, leaving the 75th Division, and arriving at Marseilles on 1 June 1918. On 5 June the battalion joined 186th Brigade of 62nd Division. After just a few weeks in France the battalion took part in the Battle of the Tardenois, 20 to 31 July 1918. Sadly Herbert was killed in action on the first day of the battle. He was 35 years old. The Western Gazette, in its edition of 23 August 1918, reported " General sympathy has been expressed with Mrs H Purchase, of 29 Percy Road, Yeovil, in the severe blow she has sustained by the death in action of her husband, Private Herbert Charles Purchase, of the Hants Regiment. Private Purchase joined the Oxford and Bucks Regiment in April 1917, but was subsequently transferred to the Hants, and drafted to Egypt in August of that year. There he saw considerable fighting. In June he was sent to France, and had only served there about six weeks, when he met his death at the age of 35 years. The late Private Purchase was well-known and highly respected in a wide circle of friends in Yeovil, and previous to joining the Army he was employed as a staker by Messrs Pittard & Hamblen, and was also a prominent local footballer. For several years he was a playing member of the Yeovil “A’s” XI, and was previously connected with the Barwick and Stoford team. The deceased has three brothers serving in H.M. Forces, viz. Private Sidney Purchase (France), Fred (also serving abroad), and Henry (in training at Gosport). The deepest sympathy is felt thorough the town with the widow who is left with four young children to mourn their loss. Mrs Purchase has since received a letter from Lieut. JJ Bennett, of the Hants Regiment, which says: “I am writing to ask you to accept the deep sympathy of the officers and men of C Company on your great loss of your husband on July 23rd. He was killed very early in the action which led to the capture of a very important village on the Marne. He was a very courageous soldier, devoted to his duty, and beloved by all those who knew him. The Battalion suffered very heavy casualties that day and I am the only officer left on duty in C Company; the others are all killed or wounded. Your husband died a hero’s death, fighting for King and country." Herbert was interred in Marfaux British Cemetery, Marne, France - Grave I.C.9, and his name is inscribed on the War Memorial in the Borough. 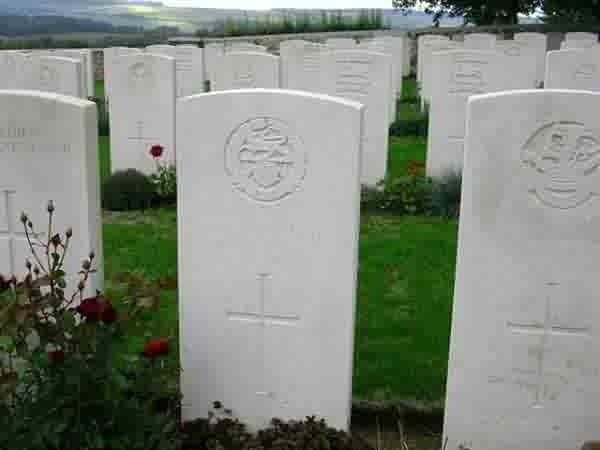 Herbert Purchase's headstone in Marfaux British Cemetery, Marne, France. 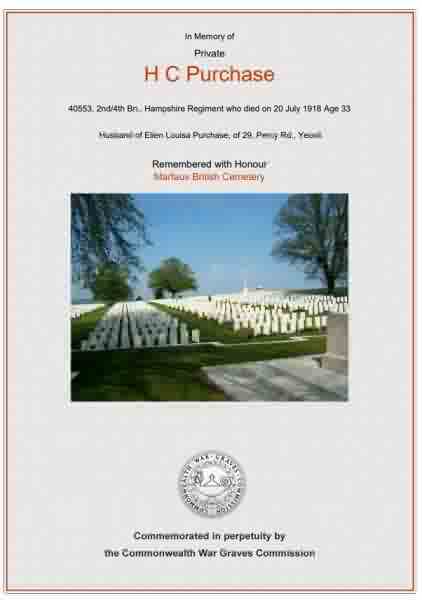 The Commonwealth War Graves Commission certificate in memory of Herbert Purchase.